Advit, part of the winning team, had come up with an idea to make a FitBit for water taps that converts water to mist, thereby reducingthe water flow and saving the amount of water utilized. This 13 year old tech freak is also an avid coder, and is fluent in four coding languages. A parent of the winning team student said “No amount of education can equal practical learning. Our children have learned a lot through practical experience provided by the founders of ENpower and the teachers present at the boot camps who guided them with the strategizing, marketing and business development division for their venture idea. We were glad to see them work with immense passion, hard work and dedication with an eagerness in their spirit to win the competition”. The Second RunnersUp team from AVM Bandra said “We had already made a skeleton of the idea, the boot camp helped us gauge competition, gave us an idea about entrepreneurship and also how we can turn this into a venture.” Their venture, named Owlett, was inspired by the zeal to provide students with news from around the world, which is fun and easy to read. Since children these days are unable to form opinions about current events due to complicated jargons in newspapers, they wanted to make a simplified version of newspapers that would make children become smarter and help them hold a conversation even about serious topics like politics and economics. The First RunnersUp team from Hyderabad presented True Wipes, an idea based on converting the so-called wasteful Corn crops into useful, chemical free, handmade wet wipes with high water holding capacity. Inspired by Ikea using sustainable replacements for wood, this team aimed to help the world with eco-friendly tissues at affordable prices and empower the jobless technocrats. Talking about India’s Future Tycoons as a platform, student from True Wipes team said “We never dreamt of becoming entrepreneurs. Like many others, we would dream of becoming a teacher, a doctor or an engineer. We initially registered to just explore the platform but today post the learning in the boot camp and working on our own ideas for the Finale, the experience has left a mark of entrepreneurial dreams in us”. There were also other award winning categories. TheMost Innovative Idea was won by a team from Kota which took part in this event through a video conference. Their idea has multiple products which advocate water conservation and reuse of Grey Water in the flushing system of toilets. The Best Brand Idea was bagged by a team from National Public School, Chennai. Their idea, called Enfocation, is a platformthat provides ExperientialLearning through local skilled worker who also benefit in the form of additional income sources.. 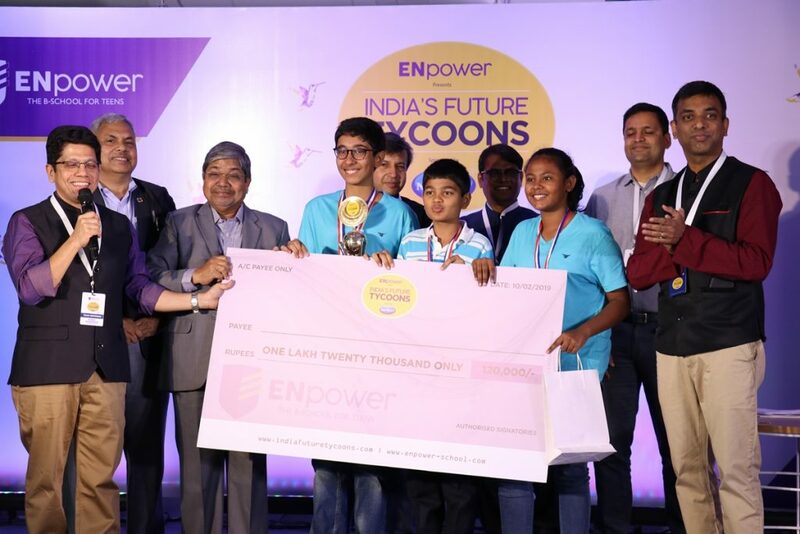 The Best Elevator Pitchwas won, again, by a team from National Public School, Chennai. Their venture,FreEd, allows public school students to partner with private school students for their education. TheBest Business Model was won by Poshan, again a team fromNational Public School, Chennai– theymade an app that provides subscription-based healthy meals for preteens from home chefs.